Myths and suppositions abound on the great general’s view of slavery. But any doubt about how ‘Marse Robert’ regarded the Peculiar Institution can be erased by examining his own words. Abraham Lincoln married into a family that included a whole lot of Rebels. From the Wilderness to Appomattox with General Richard Anderson and his troops. The brilliant beam of a Union calcium light turned night into day at Charleston’s Battery Wagner. Abe’s proposed device for rescuing steamboats sheds new light on his technological bent. The deadly geology of “killing grounds”; Richmond, Ky.’s new museum; Lincoln wanted a duel with “cavalry broadswords”. For most new visitors, new Gettysburg exhibits will be their only chance to learn about the war. New Bern, N.C.: Battlefield and Barbeque. Joseph Glatthaar follows Lee’s army through thick and thin. 150 Years Is Almost Here. 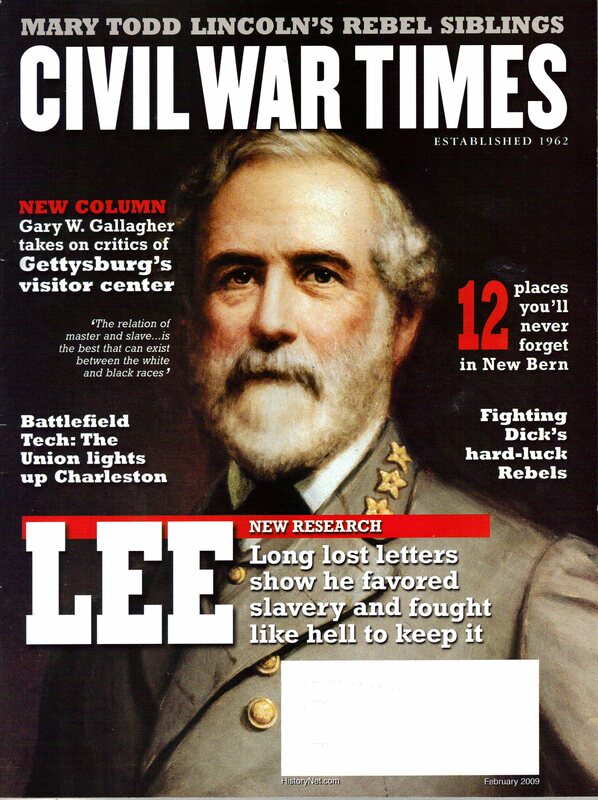 Where to find primary sources on Lee and slavery.